Sarah Brandon received her BFA in painting from the University of Massachusetts, Amherst in 1984. 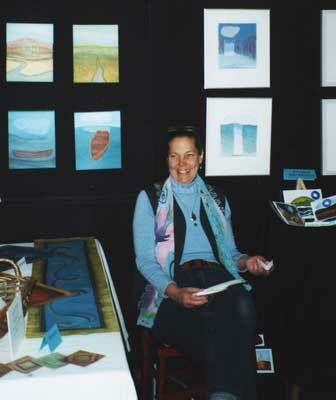 Her move to Maine in 1988 was motivated by two ingredients necessary to feed her creative process: her love of the natural environment, as well as, her desire to live in an area rich with arts and community spirit. Living in Washington County since 1992 she pursues her art endeavors in her home-based studio and continues self-employment: specializing in hand lettering and gilding on boats. This line of work requires regular travel for on-site jobs and allows Sarah to pass through and work in some of the most stunning landscapes in Coastal Maine. Traveling, “on the road”, through the landscapes we live in, provides visual stimulation along with time to “look”, “see” and conceptualize new paintings.